Heat oven to 300°F. Spray bottom and sides of 8-inch square (2-quart) glass baking dish with cooking spray. In large bowl, toss filling ingredients. Spread mixture in baking dish. In same large bowl, stir cookie mix and melted butter until crumbly. Sprinkle over filling. Bake 40 minutes. Remove from oven; sprinkle with pecans. Bake 15 to 20 minutes longer or until topping is golden brown. Serve warm or at room temperature. Serve with a scoop of ice cream or a dollop of whipped cream. 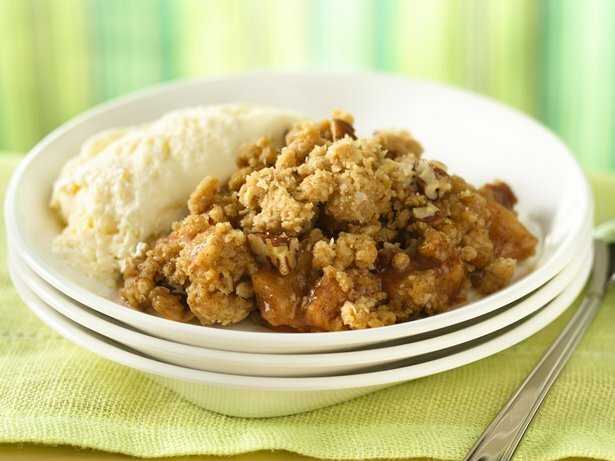 Use fresh peaches for the apples for a juicy peach crumble.